Above: Kirk Alyn in a publicity portrait for his first serial, Daughter of Don Q (Republic, 1946). Kirk Alyn, as the first actor to play Superman in a live-action film, is forever assured a footnote in histories of popular culture, but from a serial buff’s perspective he is notable for more than his Superman association. Alyn starred in six different serials of the post-WW2 era, an era when scripts were becoming more predictable and production more routine due to severely lowered budgets; his exuberant performances did much to add energy to these latter-day cliffhangers. He possessed a light touch rare in a serial hero, and balanced the deep-voiced seriousness of his heroic portrayals with several touches of quirky humor. Kirk Alyn was born John Feggo in Oxford, New Jersey, in 1910. He headed for New York City to pursue a career in journalism after graduating from college. He began working part-time on Broadway to earn money for his journalistic studies, but he eventually decided on an acting career rather than a reporting one–though, ironically, his best-known acting role would be as a certain “mild-mannered reporter.” Throughout the 1930s, he worked as a Broadway extra and dancer. In 1942, he went to Hollywood, where he played bit parts until Republic Pictures began to cast him in major supporting roles in some of their B-westerns. Among these were the 1943 Bill Elliott B-western Overland Mail Robbery, which featured Alyn as a comical gun-shy tenderfoot who ultimately proves heroic in a pinch, and 1944’s Call of the Rockies, in which Alyn played third fiddle (a courageous mining engineer) to Smiley Burnette and Sunset Carson, but did serve as romantic lead. After these early movies, he joined the US Navy and was absent from Hollywood for two years. He re-entered films in 1946, returning to Republic to co-star in his first serial, Daughter of Don Q. In this cliffhanger, Alyn did not receive top billing—that went to leading lady Adrian Booth as the title character—but enjoyed a meaty part nonetheless. His character, Cliff Roberts, was a reporter investigating the murders of various co-heirs of an old Spanish land grant which controlled valuable property in modern-day California. Heir Carlos Manning (LeRoy Mason), an antique dealer, was behind the murders, and Roberts teamed up with Dolores Quantero (Adrian Booth), the chief heir, to thwart Manning and his henchman Donavan (Roy Barcroft). Alyn’s character, as a somewhat brash reporter, was on the delivering end of more than the usual serial share of flippant witticisms, and the breezy Alyn was quite up to handling such dialogue. Above: Kirk Alyn (center) has the drop on Roy Barcroft (left) and Bud Wolfe in Daughter of Don Q (Republic, 1946). Above: Kirk Alyn battles a suit-of-armor-wearing thug in one of the oddest action sequences in Daughter of Don Q. Adrian Booth is on the card’s border. Alyn returned to supporting roles again until his second, and best-known, serial—Superman (Columbia, 1948). It might have been Alyn’s semi-humorous reporter characterization in Daughter of Don Q that caused Columbia Pictures to select him, out of a wide field of applicants, to play Superman and his reportorial (and comical) alter ego Clark Kent. Alyn himself once joked in an interview that he thought he only got the part because he happened to be the first applicant who could speak English intelligibly enough—having been preceded through the producers’ door by various wrestlers and other non-actors. His casting in the role still remains controversial among fans, since his slender, athletic physique was nothing like the popular image of a muscle-bound Superman, but in this writer’s opinion at least, Alyn did an excellent job in the role. His comic talents allowed him to create a truly amusing Clark Kent characterization (unlike George Reeves, whose Kent was as serious as his Superman), and his distinctive light-baritone voice gave his Superman a proper air of authority. The serial followed Superman from childhood on Krypton to his maturity in Metropolis, introduced him to Lois Lane (Noel Neill), Jimmy Olsen (Tommy Bond), and Perry White (Pierre Watkin), and then pitted him against a villainess called the Spider Lady (Carol Forman), who was out to gain control of a devastating ray machine and who pulled out all the stops–frequently utilizing Kryptonite against Superman—in her campaign of crime. Well-acted and fast-paced, Superman was one of the most successful of Columbia’s later cliffhangers. However, Columbia producer Sam Katzman’s penny-pinching definitely make things tough on Superman’s star; Alyn was called on to do many action scenes with little help from stuntmen and came close to serious injury more than once. Ironically, he received no screen credit for his pains; for publicity purposes, Katzman decided to announce that Superman was being played by himself, and this absurd gimmick was carried all the way to the film’s title cards. 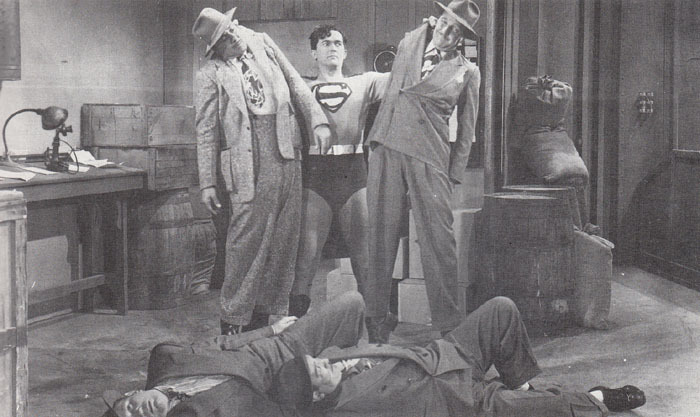 Above: Kirk Alyn as Clark Kent claims to have dreamt about being Superman, to the amusement of Pierre Watkin, Tommy Bond, and Noel Neill in Superman (Columbia, 1948). Above: Kirk Alyn demolishes a squad of thugs in Superman. Rusty Westcoatt and Charles King (left to right) are on the ground, Terry Frost and George Meeker (left to right again) are being lifted aloft. Republic Pictures, producer of Alyn’s first serial, almost immediately brought him back to star in another cliffhanger, Federal Agents vs. Underworld Inc. (1948). To capitalize on the successful Superman, Alyn was again pitted against Carol Forman, who this time played Nila, a Middle Eastern criminal determined to gain funds to control the American underworld by stealing the lost Treasure of Kurigal. Alyn played Federal Agent Dave Worth, assigned to protect the scientists who held the ancient clues to the treasure—the Golden Hands of Kurigal— from Nila and her gangster henchman Gordon (Roy Barcroft). Possibly the best of Alyn’s Republic serials, Federal Agents benefited from an unusual plot that combined two different serial genres—“gang busters” and “exotic adventure.” Alyn brought the gravitas expected of a serial G-man to his performance, but still gave it a touch of humor. 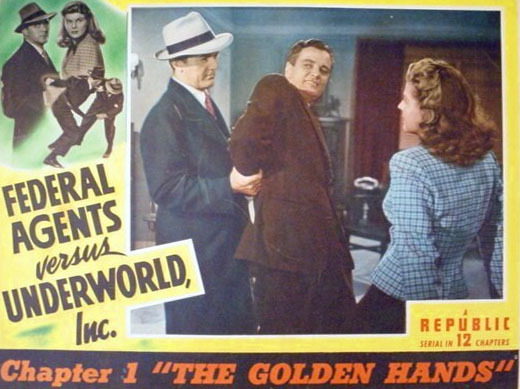 Above: Kirk Alyn rescues Rosemary LaPlanche from Bruce Edwards in Federal Agents vs. Underworld Inc. (Republic, 1948). Alyn’s next serial cast him as another Federal agent, this time a government operative safeguarding a radar project. Radar Patrol vs. Spy King (Republic, 1949), the most mundane of Alyn’s three Republic outings, was set along the Mexican border, with Alyn as Chris Calvert battling sabotage attempts masterminded by the titular Spy King (John Merton) and carried out by the slinky Nitra (Eve Whitney) and the nasty Ricco (Anthony Warde). With the help of scientist Joan Hughes (Jean Dean) and Mexican police officer Manuel Aguara (George J. Lewis), Alyn’s Calvert brought the spy king and his spy ring to justice. As in Federal Agents vs. Underworld Inc., Alyn gave standard G-man dialogue a slightly humorous edge. Above: Jean Dean and Kirk Alyn in Radar Patrol vs. Spy King (Republic, 1949). Above: Kirk Alyn attempts to surprise Anthony Warde in Radar Patrol vs. Spy King. In 1950, Alyn was back at Columbia, reprising his Superman/Clark Kent characterization in Atom Man vs. Superman. This time, Alyn was credited for playing Clark Kent, although Superman was still billed as himself. The serial brought back the co-stars of Superman (Noel Neill, Tommy Bond, and Pierre Watkin) in their original roles, and featured a new villain–Lyle Talbot as Superman’s archenemy Luthor. Luthor, who used the Atom Man alias as part of his scheme. Luthor brought into play a much larger array of scientific gadgetry than the Spider Lady had used as he attempted to take over the world and rid himself of Superman, but he too was defeated in the end. The scenes between the cheerful, effervescent Alyn and the cold-blooded, smug Talbot were one of the principal attractions of this serial; they made a perfectly contrasting pair of antagonists. Above: Superman (Kirk Alyn), dazed by Kryptonite, comes face to face with the Atom Man (right). Don Harvey is in the center wielding the Kryptonite container in this scene from Atom Man vs. Superman (Columbia, 1950). Alyn’s final serial was another comic-book-based one–Blackhawk (Columbia, 1952). Alyn played the paramilitary pilot and spy-fighter Blackhawk, who led a small squad of fellow-heroes in a fight against a Communist spy ring led by his familiar co-star Carol Forman as Laska. The serial failed to be as colorful as the popular comics on which it was based, but was still one of Columbia’s better early-1950s efforts, thanks to good location shooting and plenty of action; Alyn, as always, helped give the serial an additional lift, playing the part with his usual combination of affability and authoritativeness. Above: Kirk Alyn as Blackhawk (Columbia, 1952). Above: Kirk Alyn (left) and John Crawford are about to engage a spy plane in combat in Blackhawk. After the two Superman serials and Blackhawk, Alyn found himself so firmly typecast in the superhero mold that he was unable to get many other film assignments. After declining to reprise the Superman a third time for a TV series (the series, of course, rolled with George Reeves instead), he returned to Broadway, where he spent the rest of his remaining acting career, except for some small roles on Hollywood TV series and a few cameos in later feature films—among them the 1978 Superman movie. He retired to Woodlands, Texas in the early 1980s and made myriad appearances at serial and B-western conventions, where he proved to be as jovial off-screen as on. Unlike some actors, he never expressed resentment at having done most of his acting in the serial arena, and always looked back fondly on his career, remarking in one interview that he “would love to do it again.” He passed away at Woodlands in 1999. Kirk Alyn is still probably best known as the first Superman, but to serial fans he’ll also be recalled as a hero who, though he came late to the serial scene, aided greatly in brightening up the genre’s fading days. Above: A publicity portrait of Kirk Alyn from Superman (Columbia, 1948). Acknowledgements: A 1978 interview with Kirk Alyn on the now-defunct Superman Thru the Ages website provided me with much of the information used in this article, as did “Superman in the Serials,” an article by Eric Hoffman filled with quotes from Alyn and published in Serial World #3 in 1974. I remember in the early 70’s, Kirk Alyn was on the memorable “Joe Franklin Show” to promote his book “A Job for Superman.” I was just a boy but as a Superman fan who had never seen the Columbia serials I watched in earnest. Indeed, Kirk came off as affable, humorous, and quite proud of his career as a Serial Hero. About a year later, I discovered through “Jim Harmon’s Nostalgia Catalog” that “A Job for Surperman” was available from Kirk Alyn, himself. So, at age 12, I sent Kirk my order along with a fan letter. Thank you, Kirk. And thank you Jerry for this wonderful tribute. You’re welcome, and thank you for the personal reminiscence of Mr. Alyn. With no disparagement to George Reeves, to me Alyn will always be the definitive Superman/Clark Kent–partly because I saw the two serials as a kid, long before I started seeing episodes of the TV show–but also because I think he did a perfect job of differentiating the two aspects of the character, the daring and exuberantly jovial superhero on the one hand and the mild-mannered but dryly witty reporter on the other.